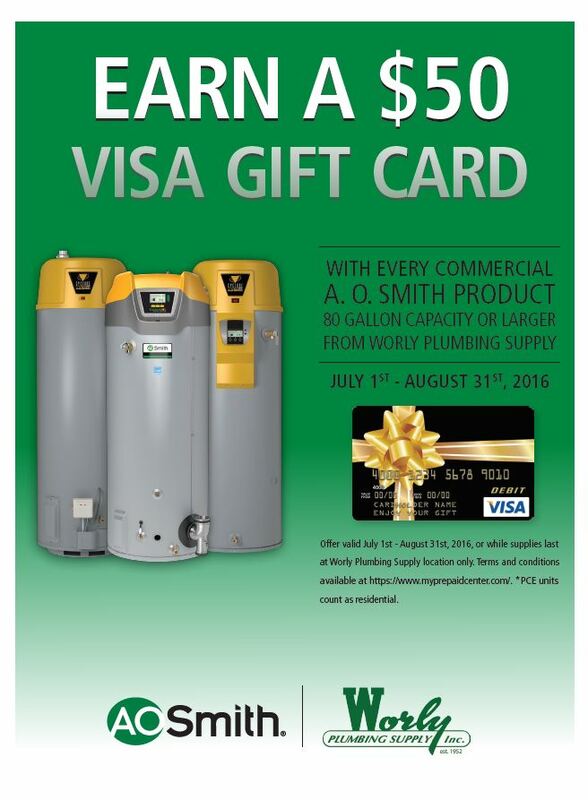 Now through August 31st, buy a commercial water heater (80 Gal or larger) from Worly Plumbing Supply and receive a $50 Visa gift card. A.O. Smith has a wide range of commercial water heaters available for both light commercial and heavy-duty applications. View our flyer or visit one of our parts counters for more information. Promotion exclusions and details are below. Offer Valid through August 31st, 2016. Only commercial water heaters in 80 gallon or larger sizes qualify for this offer. Gift cards will be mailed to purchaser after sale. Please confirm mailing address and contact information at time of purchase to ensure timely delivery.